The fog lights with bright angle eyes and devil eyes. The are made of high quality ABS plastic. Perfect aftermarket replacement. 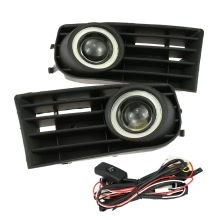 Grille fog lights give your car a new look. Fit to your car with seamless installation. Pls confirm the item if they match your car before order.